The Pentagon is fundamentally changing the way it recognizes service in a combat zone by tightening the criteria for awarding the Bronze Star and creating a new "C" device that can be pinned to other traditionally noncombat awards. The changes stem from a two-year internal Pentagon review aimed at modernizing the military medals and awards system; the final report includes 37 recommended changes made public Wednesday. "Recognizing valor should be the pre-eminent thing that we do in the Department of Defense … and we weren't doing that," said one defense official familiar with the review who spoke on condition of anonymity. The Defense Department will create a "C" device to denote an award was earned in a combat setting. It will be the same size and design of the current "V" device denoting valor and may be affixed to noncombat performance awards such as commendation or achievement medals. Under the new rules, all "V" devices will be recognition for a specific act of valor in a specific situation, while the "C" will denote that other awards were received for high performance over time in a combat environment. The Pentagon also will create a forcewide definition of "meritorious service in combat," which will apply to both the "C" device for combat distinction and also affect the criteria for a Bronze Star, which by definition is a combat medal. "We're ensuring that the Bronze Star goes out to those who are incurring the risk of combat or actually have a significant risk of hostile action," the defense official said. 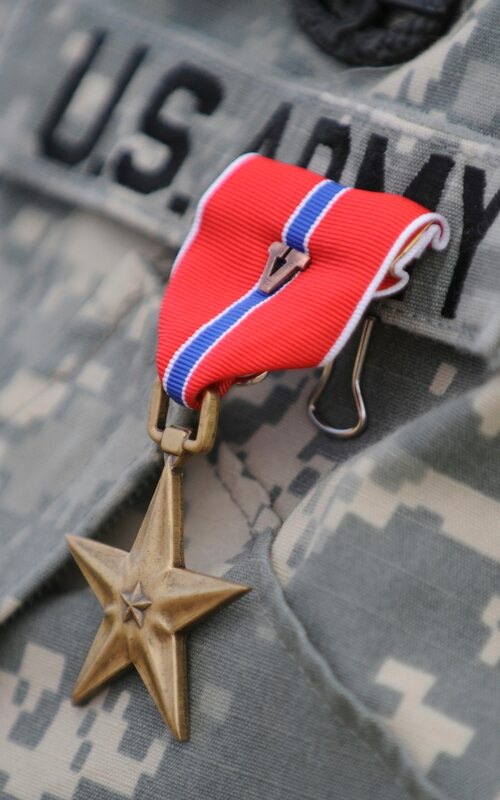 Medal policy on the Bronze Star has been criticized for years as ambiguous. In some cases, the medal is affixed with a "V" for valor and reflects courageous and potentially life-saving acts of bravery under fire. Yet in other cases, it is awarded for "meritorious service" that could be, essentially, a desk job in a deployed setting. In the 1990s, some service members with peripheral duties related to operations in Kosovo received Bronze Stars without ever leaving the U.S. The policy change announced this week requires that all future Bronze Stars meet the new and tighter definition of combat. The final wording on the policy has not been finalized, and when it is, its interpretation will remain up to the individual services. "If people were complaining that Bronze Stars are given out for things that aren't necessarily worthy of it because they're not in combat, I think we are addressing that by applying a decision that says the Bronze Star will only be awarded under combat conditions," the defense official said. For example, meritorious service in a deployed environment that might have previously warranted a Bronze Star might instead earn a Meritorious Service Medal if commanders determine that the individual faced few risks of actual combat, an official said. The standard for combat will be the same for Bronze Stars as well as for the "C" combat distinguishing device, which means there will be no circumstances under which a service member would receive a Bronze Star with a "C."
Exceptional valor will continue to be recognized by the existing "V" device, the criteria for which also will be clarified under the new policy. For years, the services have had slightly different definitions for the Bronze Star and the "V" device. "In the Army, the 'V' meant valor — so the 'V' device was only conferred if a person had done something valorous in combat," the defense official said. "And the perception when someone looks at that is that the member did something valorous in combat, but that was not always the case for the Department of the Navy." In the Navy and Marine Corps, the "V" was defined as a combat distinguishing device, so in addition to being awarded for valorous acts, it also could be conferred for meritorious service considered above and beyond in direct combat, but not necessarily of a "valorous" nature. The official said that has led to the ambiguity in the Navy-Marine Corps definition of what that "V" stood for.